MSNBC has renewed Lawrence O’Donnell’s contract, and, for now, the network’s increasingly conservative tilt is on hold. Earlier that day, when the outcome of his negotiations with MSNBC over his contract was still in doubt, a small group of O’Donnell fans staged a rally at Rockefeller Center in his support. 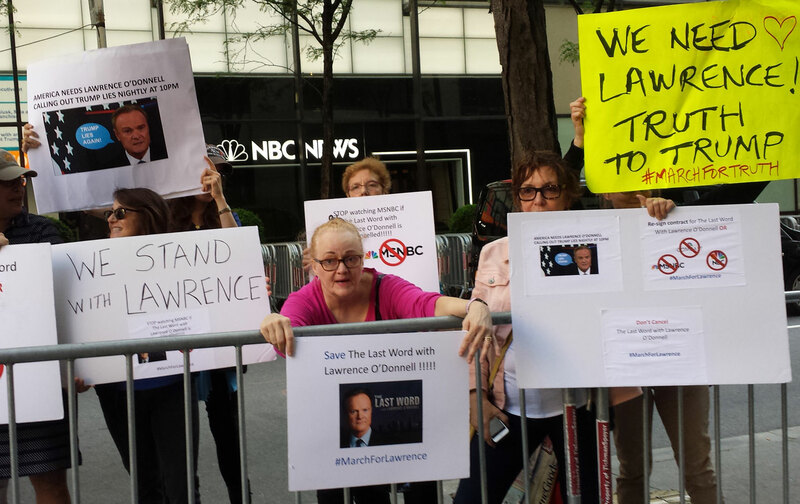 Fenced off on a slice of 49th St. across from NBC News, they carried signs like “Keep Lawrence, Dump Trump” and “america needs lawrence o’donnell calling out trump lies nightly at 10 pm.” One sign implied that if his contract weren’t re-upped, MSNBC, NBC, and their parent company Comcast would face boycotts. The small rally (with just 10 people at its peak) and one a week earlier at the same spot were organized by Annie Salas, an entertainment-TV producer. The participants drew questions from passersby, some friendly kibitzing from NYC cops who joked that they should get more rowdy, and attention from a Canadian couple who seemed confused as to what the protest was all about. “We like Trump,” the woman told Annie, who patiently tried to explain the pros of having a free press and the cons of having autocrats. Though O’Donnell will remain at MSNBC, it’d be a mistake to think that protesters were overreacting. MSNBC, long considered the liberal answer to Fox News, is doling out valuable TV time to any conservative Never Trumper or ex-Foxer who bats an eyelash at them. The former Fox anchor Van Susteren has been hosting an hour-long weekday show at 6 pm since September. Wallace, a former communications director for George W. Bush and a top adviser for the McCain/Palin ticket (which she famously didn’t vote for) took over the 4 pm slot from Steve Kornaki just a few weeks ago. Right-wing radio host Hugh Hewitt—who never-Trumped for a nanosecond—will reportedly get his own show on Saturday mornings. And to top it off, climate-change denier George Will, recently booted from Fox News for opposing Trump, has signed on as a contributor to MSNBC and NBC, where former Fox News star Megyn Kelly will debut her Sunday night show this weekend. In September, Kelly will also take over the third hour of NBC’s Today show. MSNBC, of course, has its own history of unceremoniously shedding talent. In February, Tamron Hall quit both NBC and MSNBC after being told—just minutes before going live on air for her daily MSNBC news show—that Megyn Kelly would be bumping her from Today. That followed the purges of 2015, when Andrew Lack, the MSNBC executive, let go of, or moved to obscurity, some of the channel’s more progressive daytime voices—Ronan Farrow, Alex Wagner, Al Sharpton, and Ed Schultz—in an effort to make MSNBC look more like NBC and its straight-news approach. In early 2016, Melissa Harris-Perry quit her weekend show over disputes about editorial control. “They wanted us to cover politics in the narrowest sense,” Harris-Perry said at the time. But even if Lack lusted for a more centrist prime time, it may not have made business sense to ax O’Donnell, as a number of the protesters pointed out to me. 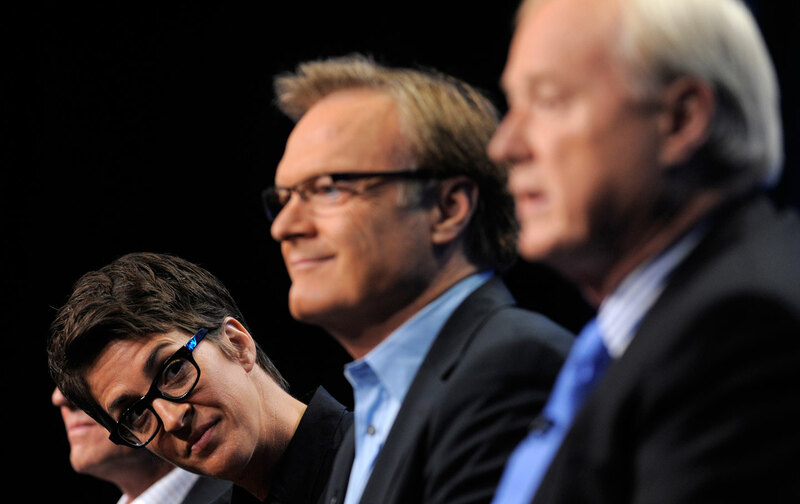 During the month of May, MSNBC earned its highest prime-time ratings ever, topping CNN and Fox in the desirable demographic of 25- to 54-year-olds for the first time in 17 years. And in terms of total viewers among MSNBC shows, also for the month of May, O’Donnell has had ratings second only to Maddow. Like CNN and Fox, MSNBC has Trump to thank for the ratings boost, but it has improved over the last year at far higher percentages than its rivals.